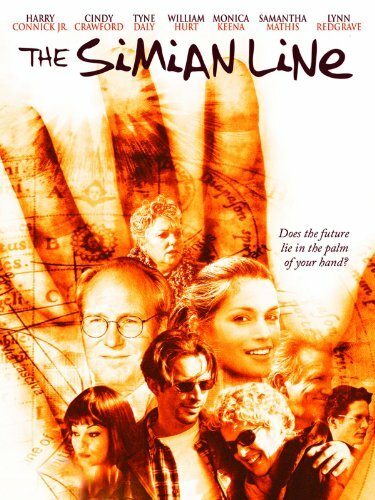 SIMIAN LINE – Can the lines in the palm or your hand predict your health or your future? The simian line became known as the most well known ‘uncommon’ palmar line variant, and when it is present in a hand it appears as if one of the normal lines is missing. 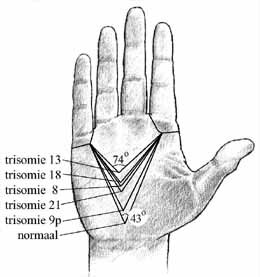 The simian lines is the result of a fusion between the two major ‘palmar transverse creases’: in the fields of palmistry these are also known as the ‘head line’ (in medical science: distal transverse crease) and the ‘heart line’ (in medical science: proximal transverse crease). About 3% of Western populations have a simian line in one of both hands, however in populations from Asia this percentage may be up to above 10%. 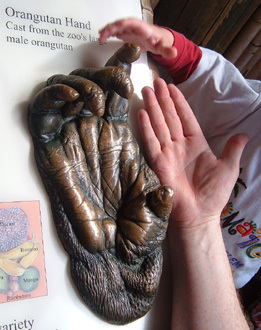 The word ‘simian line’ has a connotation with the hands of primates (simians), which are often featured with multiple likewise horizontal creases that cross the full palm. And for this reason people often prefer to use other words to refer to the simian line. The most common simian line synonyms in daily language are: simian crease, simian fold, ape crease or the four finger line. In the scientific literature the simian line is usually named as: single palmar transverse crease or four finger line. The simian line is most well-known for it’s significance in Down’s syndrome (40%). However, the truth is that the medical disorders associated with simian line are not only seen in the most common chromosomal disorders including e.g. : fragile-X syndrome (18%), Klinefelter syndrome (12%), Turner syndrome (27%) & Marfan syndrome). But the simian line is also more often seen in the most common medical disorders, such as: diabetes mellitus (10%), psoriasis (12%) & rheumatoid arthritis (18%). Understanding the nature of palmar creases requires a consideration of the palmar dermatoglyphics as well, which concern the fine ridges & grooves in the skin that can be seen in the palm or your hand with the bare eye (assuming that you have normal eyesight). Because both the palmar creases & the dermatoglyphics largely develop in the 2nd and 3th month of pregnancy under the influences of growth stress forces in the volar skin. Dermatoglyphics: AtD-angles in trisomy syndromes (trisomy 21 = Down syndrome). Few people are aware… that the ‘troublesome’ character of the simian line depends significantly on the dermatoglyphics in the so-called mount of Moon (in medical science: hypothenar). For, the high prevalence of the simian line in diseases & syndromes is typically featured with multiple deltas (triradii) and often a high positioned axial triradius, which results in a high AtD-angle. See the figure on the right: all listed trisomy syndromes are also known for a very high prevalance of the simian crease. Therefor, in order to understand the nature of a simian line in the hand(s) of an individual – an analysis of other hand features is a first requirement: the simian line on it’s own means … nothing! Scientific research R.S. Bali has presented in his book ‘Anthropology of Crease Morphogenesis‘ a summary of studies which have presented significant results for the simian line in the perspective of criminal behavior, character & temperament. But even quite a few celebrities have a simian line! 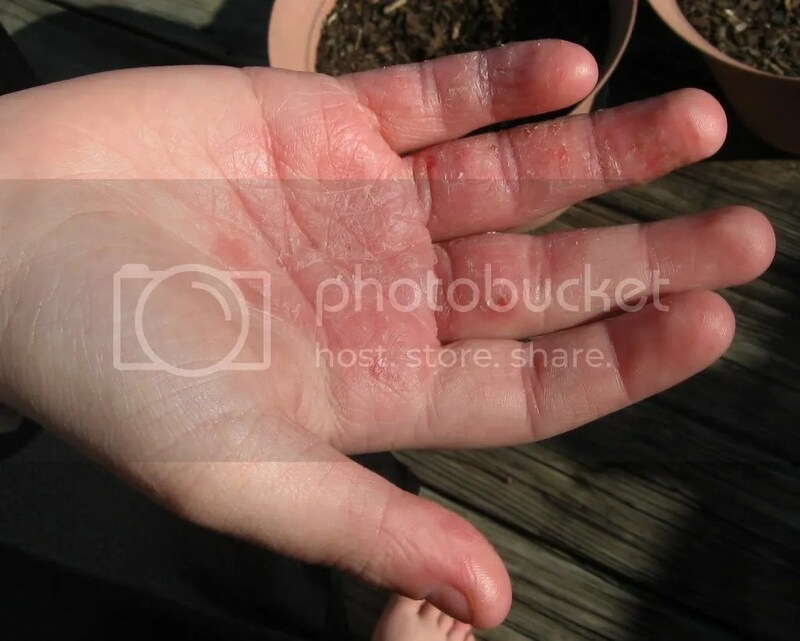 SCARY HANDS (1) – Eczema hand conditions can be annoying, but usually these are harmless! Many hand skin conditions do not indicate that anything else is wrong with you. Hand eczema can happen to anyone typically manifests as dry hands. Dry hands that persist despite the use of lotions and creams may be a sign of a condition called hand eczema or dermatitis. However, hand eczema may sometimes be difficult or impossible to differentiate from more worrisome hand conditions, such as: atopic dermatitis, allergic contact dermatitis, and psoriasis, which also commonly involve the hands. And even a biopsy for all these conditions may not result in a definitive diagnosis. Below follows an overview of ‘scary’ hand conditions that are usually harmless. Hand eczema is a term used for different types of hand skin inflammation (dermatitis). The symptoms of eczema typically include itchy, reddened, dry skin. Many things can cause this type of skin irritation such as dryness, soaps and detergents, cleaning products, rubber gloves and even cosmetic lotions and creams. Since the skin is itchy, prolonged scratching often occurs which in turn leads to reddened, irritated, scaling skin or to a leathery thickening of the skin (sometimes called lichenification). Cracking and weeping of the skin may also occur and open sores may become infected. 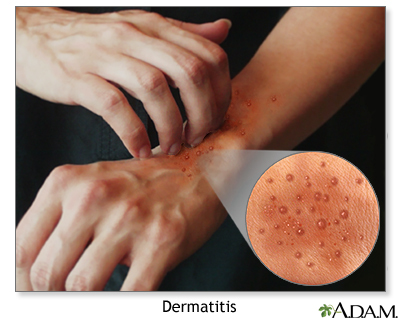 And there are basically two types of dermatitis: ‘contact dermatitis’ and ‘atopic dermatitis’. The causes of eczema have not been fully determined, but allergies, stress, irritants, and genetic factors are all associated as possible causes for the development of this hand condition (see the photo below). Granuloma annulare is a chronic skin disease consisting of a rash with reddish bumps arranged in a circle or ring. Granuloma annulare is different from warts. A cryotherapy treatment typically will not produce permanent results. And this skin condition most often affects children, young and older adults and it is also slightly more common in females. This hand skin condition is usually seen in otherwise healthy people – though sometime it is associated with diabetes, thyroid diseases, or auto-immune diseases. But there are other hand skin conditions that can be relatively harmless, such as: red skin, blisters, microinfarcts, little spots & vasculitis.